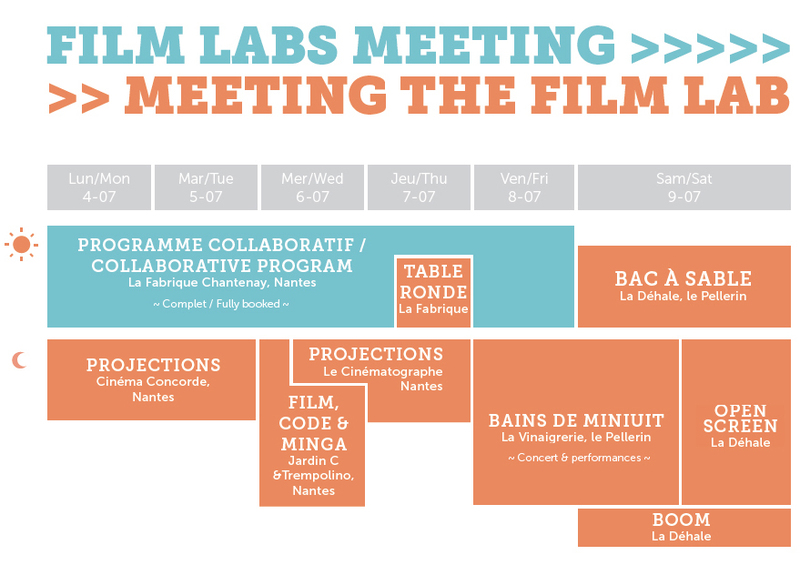 FILM LABS MEETING, is the internal part of the event and it will take place from monday to friday at La Fabrique Chantenay. For registered participants, it will be the place where you can find infos about…almost anything. From Monday to Friday, La Fabrique Chantenay is open for the collaborative programme from 9:30 to 19:00. Every day begin with the Plenary meeting starts at 10:00 (precise ) and should end at 11:00. On sunday 3th july, a welcoming drink is offered at La Fabrique Chantenay from 18:00 to 20:00 ! And the Mire team will be there from 15:00 to 20:00. Everyday from 13:00 to 14:30. > You can also prepare your itinerary on the TAN (Transports de l’Agglomération Nantaise) website. On the day of your arrival at la Fabrique Chantenay, you’ll get your Participant Pass. 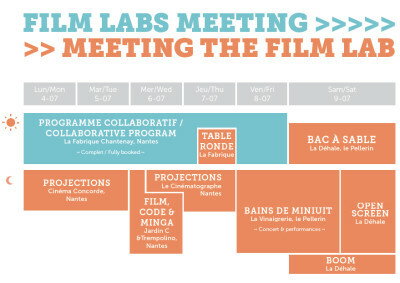 It gives you an access to all the public program Meeting the film labs, subject to avaibility of space. The capacities of the movie theaters is about 150 people. So on Monday and Tuesday, each program is going to be shown twice (every projection is open to the public). Reminder : For projections and performances be on time, as we can’t guarantee entrance for latecomers. To go to Le Pellerin on friday and saturday you can use public transports (details will be given on the spot). To come back to Nantes after the evening we reserved 1 bus that make 2 travels (50 seats each) to Nantes’s city center. On friday at 1h15 and 2h15. On saturday at 1h15 and 3h15. There is some fields around La Déhale where you might find a spot to put a tent. Beware, not a real camping!